Get off those bikes – Get out of the flower beds – if I catch you I’ll swing for you! Musician and producer Charles Foskett, a youthful Arthur’s Hill resident back in the 1950s, somewhat fondly remembers being shouted at by the Nuns Moor Park Keeper, or the ‘Parkie’ as he was known. Charles Foskett school was Todds Nook on Walter Terrace, which closed in 1983. The building was later used as a base for urban regeneration project City Challenge, before being demolished to make way for housing. He recalls vividly how he and a friend one night decided to ‘landscape’ the centre of one of the park’s bowling greens. The park was locked (as was usual at night), but that didn’t deter Charles and his friend. “We decided it might be a good idea to plant several privet hedges, a couple of flower beds and construct a rockery complete with a statue, in the middle of the bowling green. He got into trouble anyway for being late home, but was lucky he escaped detection by the ‘Parkie’, who would have seen to it that Charles and his partner in crime were “made to work” their weekends “cleaning the park public toilets for him as a penance”. Times change. Gone is the ‘Parkie’. Gone are thepublic toilets, cleaned by errant children as penance. Gone too are the bowling greens. Nuns Moor Park is a very different place to yesteryear. The plants still thrive, but they are no longer the domain of a Park Keeper. Today, a collective of local residents (supported by local organisations such as Greening Wingrove and the Time Exchange) maintain its wildlife. A purple community centre (the Nunsmoor Centre) now dominates the landscape on one side of the park, which straddles both sides of Brighton Grove up to the iconic pink BBC Newcastle HQ. 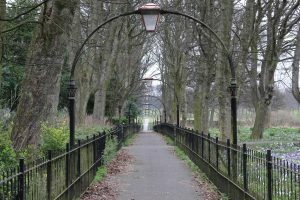 Once, the wooden bowling pavilions, the bowling greens, the well-maintained shrubberies and flower beds had pride of place in Nuns Moor Park. 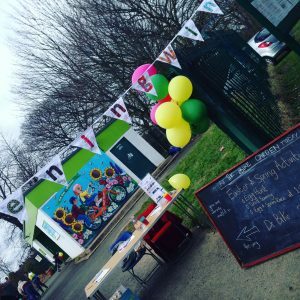 Today, one of the greens is a community space where people can go on organised cycle rides, learn about growing food, attend a festival even, or get involved in park maintenance. If you explore a little further, you’ll find recently established orchards with trees that were more fashionable in Victorian times, like medlar and walnut. Look further and you’ll find a plaque commemorating the strong local association with and contribution of those that gave their lives in our wars. There’s a sensory garden where visitors can enjoy the rich perfumes of nature. There’s a mural designed by young people whose families have more recently made Arthur’s Hill their home. You can even find a South American style outdoor pizza oven. It’s a park with a lot going on, but management of the city’s recreation areas is about to undergo a big transformation.